Imprudent actions of privileged users in Active Directory can result in highly undesirable consequences for an organization. For example, misconfigurations can lead to costly downtime, and incorrect changes to passwords, permissions or user accounts can require time-consuming troubleshooting or cause security incidents. Privileged user activity tracking helps ensure timely detection of inappropriate changes, enabling resolution before they result in downtime or a security breach. However, native auditing capabilities cannot deliver continuous tracking of user activity. Netwrix Auditor for Active Directory is software to track user activity that provides the most detailed picture of Active Directory changes made by domain administrators and other privileged users. It delivers clear, actionable information about Active Directory activity to senior administrators, IT managers and other stakeholders who need this data. Tracking user activity with Netwrix Auditor greatly simplifies auditing and reporting tasks. Reports available in Netwrix Auditor deliver all the critical details about every change in Active Directory, including who, what, when and where details, as well as the current and past values of every modified object. Additionally, real-time alerts enable IT staff to stay current on the most critical configuration changes. These user activity tracking capabilities, combined with regular review of this activity, helps organizations constantly validate that established procedures and security policies are being followed and no inappropriate changes occur. Tracking user account changes in Active Directory is critical for compliance and security, and it is also important for operational efficiency. For example, inactive user accounts, new accounts with extensive permissions, disabled accounts and suspiciously modified user accounts can all negatively impact compliance, network security and productivity. 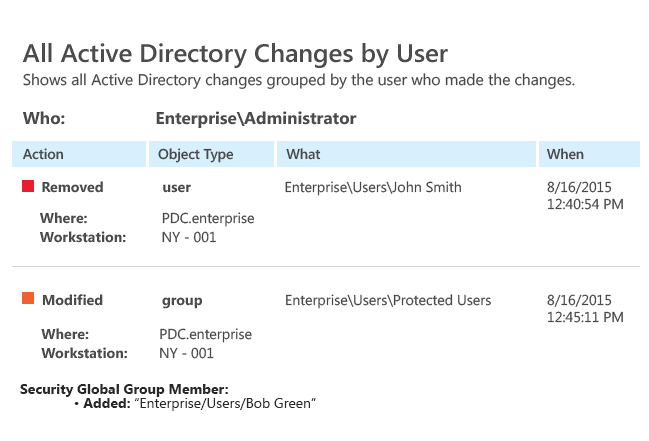 In this how-to, we show an easy way of tracking changes to user accounts in Active Directory. The creation of fake user accounts in Active Directory might be a sign that outside or inside attackers are trying to get "the keys to the kingdom." It’s vitally important to monitor user account creations in order to reduce the risk of security breaches. This how-to shows two ways of detecting who created a user account in Active Directory. Any accidental or malicious change to organizational units and groups in Active Directory can turn into a pain in the neck for both the IT department and the affected users. For instance, if an organizational unit containing user accounts is deleted, users will not be able to log in. Those who are already logged in might experience trouble accessing email, files, SharePoint and other resources. This how-to illustrates two ways of detecting changes to organizational units and groups in Active Directory. Users whose accounts have been disabled, either accidentally or maliciously, will be unable to log into IT systems using Windows authentication. Those who are already logged in might experience problems accessing email, files, SharePoint, etc. In this how-to, we show an easy way of detecting who disabled a user account in Active Directory. Changes to a user account password that are made by anyone other than the account owner or a legitimate IT administrator can be a sign that the account had been hacked. A malefactor who has gained access to a user account may be able to read, copy, delete and distribute sensitive data, putting the organization at risk of significant data leaks. In this how-to, you’ll learn about two ways of detecting password changes in Active Directory. For more detailed information on tracking user activity with Netwrix Auditor for Active Directory, see the full list of all predefined reports available in the product.